Waking up in the warm Costa Rican weather on our first full day feels incredible. Also, knowing we get to start our day zip lining through the beauty of Costa Rica got me out of bed right away. This being my first time zip lining, I feel lucky to be able to have experienced it here. My favorite part about the zip lining was the view of the ocean while up in the trees, as well as the friendly wild animal we met named Scar. I don’t know what species of animal this was, but he reminded me of dog because he enjoyed a nice snack with our group while we rested in a tall tree. After zip lining, we ate a wholesome meal at Jardin Marino which hit the spot. 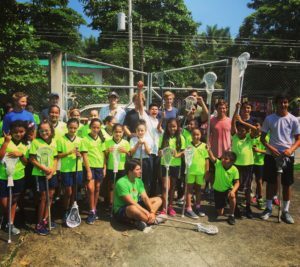 After this we went to a elementary school and hosted a lacrosse clinic for the students. As fun as the zip lining was, nothing brings a better feeling to you then opening these kids up to lacrosse for the first time and seeing wide smiles on all their faces. In the afternoon, in order to beat the heat, we went to the beach to swim for a couple hours in the refreshing ocean. Finally, we ended our day with lots of pizza, time to relax, and get a good night’s rest.